This breakfast mix has suprisingly been an all day vape for me. Like most of my mixes, its lighter in the flavors to work for a higher watt device. If it doesn't feel flavorful enough to you, mix it as a concentrate then use a higher overall %. The flavor tastes like cheerios mixed with sweetened craisins turned into a breakfast bar held together with a raw honey cookie butter. Ok so if you ever want a great cheerios stone, this is it. Sweet rice is a great flavor. When mixed with a touch of wheat it bends right into the classic plain cheerios. The honeycomb and almond cookie are acting as the glue that hold the cheerios and craisins together. Honeycomb is like a raw honey. 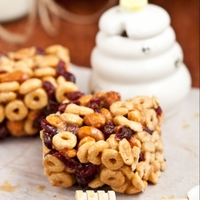 Its sweet and with the almond cookie, actually helps turn the cheerios into honey nut style. The apple cranberry is a solid flavor, it doesn't quite have the craisins texture, but the taste is perfect. The meringue sweetens it up while also helping reduce the dryness of the cheerios. This actually tastes fantastic as a shake n vape. Let it steep a few days though for all the flavors to blend together. Derived from ExclusiveGirl's Cheery Morning #MixinVixens by ExclusiveGirl. This recipe is the property of mixinvixens and released under the CC Attribution-NonCommercial-NoDerivatives 4.0 license. You may not copy, derive or commercialize this recipe without following the terms of this license or the explicit permission of the creator. This tastes like that cereal bar picture, for sure. It’s a also great reminder of how good FE Sweet Rice is. That base does make an excellent Honey Nut Cheerios type. I don’t think VT Honeycomb actually tastes like raw honey at all as the notes say it does, but in the mix with the WF Almond Cookie, it really does taste quite a bit like the baked-in honey of honey nut Cheerios. Nice sort of nondescript fruitiness makes it interesting. I get some pretty solidly unpleasant throat hit from this much FLV Apple Cranberry standalone, but the sweet stuff here seems to be calming it down completely at a six-day steep, so it’s perfectly painless. FLV Wheat without a lot of help is gross, and it’s difficult to work with, so I can’t recommend everyone just rush off to buy it. But if you already have it, definitely mix this up. Or pick it up if you’re obsessed with vaping Cheerios, or you just want to marvel at the level of skill brought to bear on this recipe.